More than 50 men, women, children and even a few pets turned out for a photo with the Gazette last Wednesday and to discuss what they see as an accident waiting to happen. 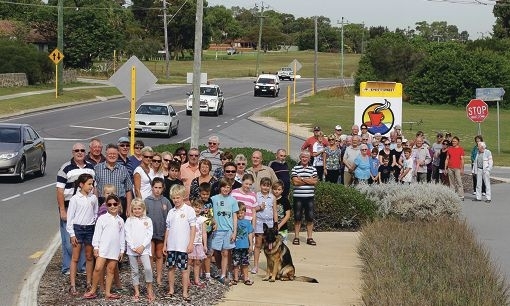 Coogee Beach Progress Association president Glen Diggins said residents held a number of concerns, citing the 70km/h speed limit so close to the popular beach, a number of dangerous entry and exit points, a lack of safe crossing points for people on foot and the fact the road is a single lane, as the cause of most problems. Mr Diggins believes the area could be improved with more turning lanes, more paths and a reduction in the speed limit to 50km/h for that stretch of road. Cockburn Council’s engineering director Michael Littleton said the City was working with Main Roads to find a solution, saying a meeting between all three parties would be held soon. A spokesperson for Main Roads (MR) said they had not received any correspondence or complaints regarding Cockburn Road, although a recent MR site investigation revealed no significant difficulties or delays for vehicles exiting Mayor Road at Cockburn Road.